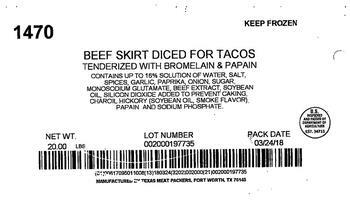 PFP Enterprises, also doing business as Texas Meat Packers of Fort Worth, Texas, is recalling approximately 7,146 pounds of raw beef products. The recalled products, bearing establishment number “EST. 34715” inside the USDA mark of inspection, were shipped to institutional and retail locations in Alabama, Arkansas, Indiana, Louisiana, Mississippi, Missouri, Oklahoma, Texas and Wisconsin. Consumers with questions about the recall may contact Shane Fresh of Patterson Foods, at (817) 546-3561.